MB Autoworks’ Shop Manager Ed Rackham has been in the automotive sector since finishing school in his native UK. For 16 years while still working full-time, he served in the UK’s volunteer reserve force – The Territorial Army – reaching the rank of Corporal in the Light Infantry and carrying out exercises in Gibraltar, Cyprus, Belgium, Belize, Ireland and Great Britain. Ed has completed numerous courses for such manufacturers as Ford, Vauxhall and (of course) Mercedes-Benz, has worked for large independent autobody repair organizations on both sides of the Atlantic, and has also spent time on the insurance side as an appraiser. Ed’s simple philosophy is shared by many of our managers in the Craftsman Group of Companies: “The customer is always right, and if there is an issue, I will always go above and beyond to rectify the matter if it is our fault. 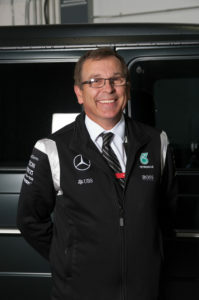 In the autobody repair industry, he has a reputation for being honest and professional, for having an extensive knowledge of Mercedes-Benz and other luxury vehicles, and is frequently contacted for advice by insurance companies. Ed will be delighted to make your acquaintance – and your entire vehicle repair process as painless as possible. Tong Cam has been a car guy since 2010, both as a salesman for a major Japanese company and as a customer service representative in autobody repair. What’s the secret to being a great Estimator? Tong makes sure ever job is done right, and enjoys seeing the look on the customer’s face when the newly repaired car is revealed. “It’s like they’re buying a new car again,” he says. According to Tong, he has two families – his blood family (including two daughters) and his work family. “Both are important in order to succeed,” he says.